Huston Platt and the Dixie Twister Camaro Funny Car which has provided him with both tragic and wonderful times. It’s mostly due to the unselfish efforts of one of Platt’s former crew members, Randall Davis. I first met Davis a little over a year ago, when he and I showed up at Platt’s home near Atlanta. I brought a notepad and tape recorder. He brought the Dixie Twister, Platt’s old Funny Car, which he had found under a tarp in a building in Nova Scotia and restored to its original condition. I was reluctant about the whole thing, given Platt’s extreme unhappiness with his previous dealings with the media. But when Davis rolled the gold Camaro off the trailer, it seemed to put everyone there at ease. The Platts and Davis laughed and smiled as they reminisced about their glory years in the 1960s, when Platt’s drag cars were among the fastest Chevrolets in America and he was in such demand that a Chicago-based agent handled his bookings. They talked about racing against – and beating – the big-name drag racers of the day and winning match races against NASCAR stars such as Richard Petty, even though the Platt cars usually lacked the factory backing others had. “I beat ’em all,” Platt said. They also talked about life on the road, about the night they ran out of gas on the way to a track in Canada and siphoned enough from a farm tractor to make it to the next town. Jordon Platt tried on his grandfather’s old helmet and checked out every inch of the car. Rocky Platt gently turned the pages of an old scrapbook filled with yellowing newspaper accounts of his father’s many triumphs. The scene was made possible because in restoring the Dixie Twister, Davis also restored its driver. Seeing his old car in its former glory has brought Huston Platt back to the sport he once loved. For many years before, drag racing was something that was rarely discussed in the Platt household. That was because of the events of March 2, 1969, at Yellow River Dragstrip in Covington, Ga.
Huston Platt was in the Twister racing Frank Oglesby on a narrow, sandy track. Fans crowded to within a few feet of the track to get a better view of the cars. Some were literally hanging on tree limbs. Witnesses said one of those fans reached onto the track to retrieve a beer can just as Platt deployed his parachute to slow his car. The opened parachute swept up the man, killing him instantly. The weight of the victim against the parachute yanked Platt’s car into the spectator area. Twelve people died, and more than 40 more were injured. It remains the worst racing disaster on U.S. soil. Yellow River, one of Georgia’s most popular tracks, never held another race. Investigators determined that unsafe track conditions were to blame. Racing, as it has done throughout history, had outrun the safety measures of the day. But the incident led to sweeping safety reforms in all types of motorsports. New legislation required tracks to be carry insurance, and the insurance companies helped ensure the safety of fans and competitors. Even NASCAR founder Bill France found himself testifying before legislators on behalf of the racing community. “It was going to happen,” Platt said quietly the afternoon I interviewed him. “It was just a matter of when and where. There wasn’t a track in 10 states that was qualified to run those cars back then. Other than the damage to the fiberglass body, Platt’s car, which he was racing for the first time, wasn’t seriously damaged. Investigators looked at every part and determined that there was no fault with the vehicle. Still, the incident weighed heavily on Platt, for years and years after the crash. “I’ve got feelings just like everybody else,” he said. Platt raced on for a couple of seasons after Yellow River but grew tired of trying to outrun the powerful Chrysler hemi engines of that era. He sold his car and tried to forget about racing. He and Davis drifted apart and eventually lost track of each other, but Davis often thought of his old racing hero. “He was like a daddy to me,” Davis said. A few years back, Davis began searching for the old Dixie Twister. Every lead turned cold. Then a tip led him to Nova Scotia. Knowing the car as he did, he checked it thoroughly and realized he’d found the Twister. He brought it home and painstakingly restored it. Once it was done, but before he put Platt’s name over the door, he called him to seek his approval. A date was agreed upon, and Davis took the car to Platt’s home. Only afterward did the Platts realize that the date was 39 years to the day after the Yellow River crash. Rocky Platt was worried about his father’s initial reaction, but only for a moment. The man who once tried so hard to avoid racing, now wanted to be a part of it again. After Davis left, Platt’s grandsons searched the Internet for information about his career. They were stunned at the amount of information posted. 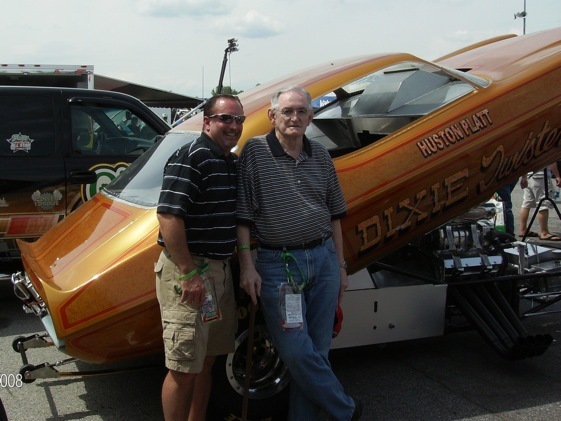 Bob Frey, the longtime traveling announcer for the National Hot Rod Association, said Platt, along with his brother, Hubert, were key players in the formative years of drag racing. Last year, for the first time since 1975, Huston Platt went back to the races. He attended the Southern Nationals at Atlanta Dragway, where he spent an afternoon joking with old friends, shaking hands with fans, signing autographs and posing for pictures. Only one person mentioned the crash. Davis said that afternoon that all the time and money he spent on the car has been well worth it. “To see Huston smile when we cranked it up was enough for me,” he said. “As long as it brings back any good memories for him, that’s all I care about. Wow. Gripping story. Guess I was too young to remember the tragedy but sure is great that Platt and the Twister have found new life. Thanks for writing it. Solid reporting job on Mr. Platt and his Camaro, Rick. Makes me want to try to find my old, and beloved, ’68 Camaro street machine.